Sitting here catching up on my DVR’d shows I see that today Queen Latifah wore Asos for her segment. I was ecstatic when I saw this. Not only because as I’ve said before, we finally have someone of ‘size’ on TV so when looking at her wardrobe recaps it actually relates to me. But in instances such as today, her attire is actually affordable to most. 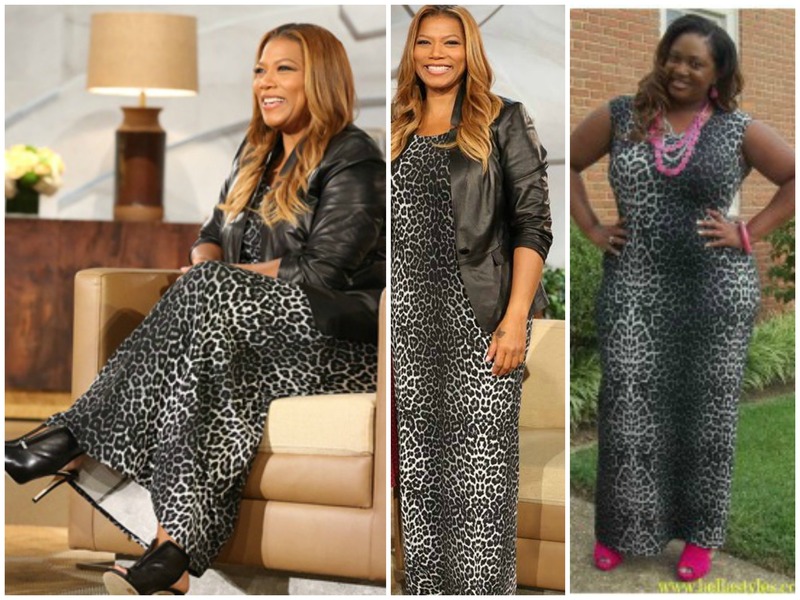 Queen was wearing the Asos Curve Maxi Dress in Animal Print and guess what, YES, it is still available on the site and at the sale price of only $24.92 down from $62. But you wanna know the coolest thing about this dress, I HAVE IT TOO. Not sure if you remember or not but I wore it here during the summer. I’m sure Queen Latifah was quite comfy in her wardrobe today because I love mine and have worn it many times over the past few months. She even mentioned during the show about how she loves maxi dresses and you can transition maxi dresses into the fall season. Wow, who would’ve thought, me and the Queen have similar style. If you like this dress too then you better hurry and ‘Grab Her Style’ before it’s gone!